Before its occupation, the theatre was part of a broader network of public theatres managed by the Italian Theatre Authority (ETI), a public authority closed by the Minister of Economy in 2010 on the ground of its assumed ‘lack of utility’. Behind this decision stood a larger plan by the Minister implementing massive cuts on public spending, particularly in the culture sector (with targeted activities ranging from performances and exhibitions, up to research, education, etc. ), as part of austerity measures aimed to combat the recent international financial crisis and reduce Italian public debt. This was accompanied by an intensive campaign of privatization, which included, among its many targets, the management of public services and public goods, particularly those related to water. In this context, a turning point was represented by the 2011 water referendum, which abrogated a 2009 law allowing for greater participation by private investors in the management of water services. The movement which opposed the 2009 law and led the campaign for the referendum, adopted the slogan, “The water is a commons”, meaning that water shall be treated as a right, not a commodity, and thereby removed from the logic and the all too visible ‘hands’ of the market. The referendum campaign resulted from the direct and personal involvement of many people who were resisting persistent attempts by major parties to boycott it, a resistance that contributed to bringing the whole question of the commons to the fore as a crucial present-day political issue. 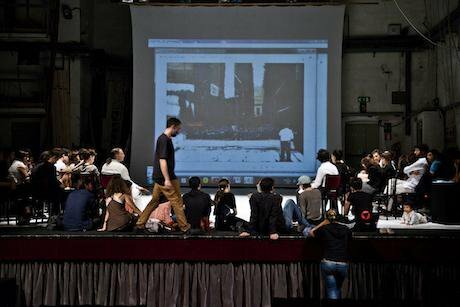 The day after the referendum, on 14 June 2011, a group of workers in the arts and culture sector (actors and actresses, technicians, performers, dancers, directors and writers) occupied the Teatro Valle in response to cutbacks in the culture sector and rumours regarding the local authorities’ decision to sell the theatre to private investors and convert it into a commercial business. The occupation, which had adopted the slogans, “Like air and water, culture is a commons” and “Teatro Valle is a commons”, was originally meant to last for about three days. As news of the occupation began to echo across the country, however, hundreds of people – not only workers in the show business, but also workers in other sectors, researchers, ordinary citizens and public figures – got involved in the occupation, which was then prolonged open-endedly. Following from this scenario, the occupants decided to give substance to the idea that the theatre was a commons, and began to enact a process of institutionalization of both the occupation and the democratic management of the theatre, creating the first institution in Italy formally based on the idea of the common good. This ‘institution-of-the-commons’ would be based on the practice and the action of “commoning”. In concrete terms, it was decided that the occupation would obtain legal recognition through the creation of a ‘Foundation’, Fondazione Teatro Valle Bene Comune (Foundation Theatre Valle Common Good), an administrative model allowing for a high degree of flexibility, and adapting its structure in certain ways to the ideals informing the movement. The challenge was to create an institution able to express the type of informal practices that the occupants associated with their idea of the commons, avoiding any potential risk of bureaucratization and crystallization linked to the management of the institution. The process went on for two years, during which a Statute was created, resulting from the on-going contribution of citizens and legal experts. An Assembly composed by the participants in the activities of the Theatre at any given moment was finally created as the central organ of the Foundation. The Assembly was thought of as an open institution, whose composition would change with the variation in people acting in the theatre (therein sustaining the principle that the possibility of action depends on the conditions of life, which are ever-changing, and the skills needed for the resulting activities). So the assembly becomes a ‘subject’ formed through action; it is stable, permanent, yet it changes as the actions in the theatre change. The other two organs in the Foundation are a broader annual Assembly composed of all members of the Foundation who pay an annual membership fee or contribute with occasional work, and an executive board with a coordinating function composed of 12 people in charge for 24 months with appointments shifting every eight months. The transition towards the formal recognition of the Foundation by the administrative authorities required a very strong effort on the part of the participants. While all the legal documents and financial requirements were finally put in place to support the initiative, at present (February 2014) Teatro Valle is still trapped in an “in-between” limbo after the occupation and before the Foundation. In the understanding of Teatro Valle, the occupation of a place implies the ability and will to change the place through the materiality of the bodies and the relationships intertwined within and with the place. Since the beginning the theatre was conceived as an agora; that is, a political space in which the commons takes place, an open space of relationships, encounters, interactions, sharing and conflicts (Gentili, 2011). The occupants have worked to make it a “public space” and open it beyond professionals to all citizens. The objective is to allow the expression of a horizontal way of political living articulated through direct relationships. One of the main goals and activities at Valle, besides cultural and artistic production, is the promotion and sharing of forms of knowledge that are excluded from institutional places. The effort is to go beyond the limits normally imposed on culture, allowing its free expression as a commons. In the attempt to add new values and change the traditional use of the theatre, Teatro Valle promotes and offers the possibility to accommodate the artists performing in any given moment in the theatre. This allows for the transformation of the theatre both as a public space (the agora) and as a home. The occupation allowed citizens to re-appropriate an area of the city that had traditionally been designated to political and economic institutions, and to tourist enterprise. Teatro Valle is located in the historical centre of Rome. This area is not neutral as it carries strong political and symbolic meanings. The proximity with key institutional buildings entailed for Teatro Valle the need to compete and struggle for its place in the city centre. The whole neighbourhood was crucially deprived of everyday life as an effect also of the strong pressure coming from gentrification, property speculation, and the pervasive commodification of urban spaces that tourism produces. The occupation contributed therefore to changing the typology of people having access to this area: not only tourists, politicians, workers in the public administration and government and international offices, or people traversing the city centre intent on shopping; but also ordinary citizens who were substantially excluded from this area, and who come from the suburbs of Rome or other areas in and outside the city. Their participation and enactment in the Theatre requires sometimes hours spent in travel but it contributes to generating a common place in which a cultural alternative with high innovative value has finally found expression. In this respect, Teatro Valle is not a territorial, but an elective community. The occupation therefore generated important questions about lifestyle, habits, behaviours, and social models: in other words, the material conditions of life. But it also gave rise to crucial questions regarding the city. In this direction, several activities have taken place over the past two years aimed at deepening common awareness about urban life. 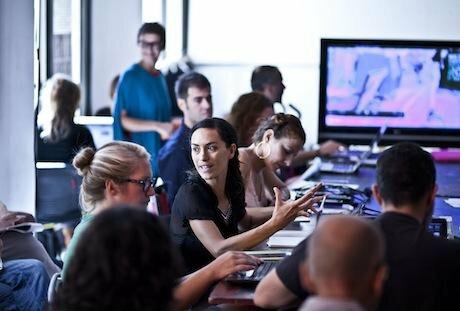 A course based on mutual learning, for instance, was organised on the topic ‘the Right to the City’, with early meetings centring on ‘the body and the public space’ in which artists and activists exchanged their views and experiences. Besides the numerous cultural, artistic and political events that Valle has hosted since the occupation, very much the result of the ongoing collaboration of artists and intellectuals, the theme of urban space acquired increasing centrality over time. Another seminar, for instance, was organised in association with a doctoral course at La Sapienza University on the topic ‘new spaces of citizenship’, which was followed by a series of mutual learning activities on the urban commons. While initial attention was directed to the theatre and the public management of cultural buildings in Italy, focus began gradually spread to issues of urban space in general. On-going reflection has highlighted the many links between capital and the city (Harvey, 2012) and the way in which conflicts and struggles allow everyday life to re-generate itself. These reflections, as embodied and articulated by Teatro Valle in relation to the ‘production of the city’ and the mechanisms of enclosure of an urban commons, offered a shield against utopian or nostalgic appeals, both uncovering the effective and concrete ways in which the commons are constantly produced and maintaining the focus on the contemporary predicament of the city, not its mythical or symbolic past. This also helped to highlight the complexity informing the life of present-day cities, shifting the focus from property to the use of space. These views made essential the need to create links and intensify the relation with other activists working on the same field (a network links Valle with other occupied cultural spaces in Italy), squats and movements working in Rome on the ‘right to inhabit’, committees involved in the the safeguard of local territory, land and public space, LGBT or migrants collectives, and so on. It is in this sense that the Right to the City came to play a central function as a concept inspiring a variety of efforts, included the attempt to federate the different movements, to allow new perspectives to emerge and disseminate, to maintain the focus on the general conditions of life in the city and to link the political to the materiality of bodies and spaces. A social practice based on experimentation and the exchange of new perspectives and experiences was thought of as the best way to innovate. By combining different forms of knowledge and expression, this practice allowed the Valle not only to progress beyond the standardization of disciplines, but also to account for the complexity of the urban condition. In the wake of these engagements, the week organised in association with the Open University’s research team working on the ‘Oecumene: Citizenship After Orientalism’ project, brought new material for reflection. It offered an invaluable opportunity to gather people from different cultural and geographical backgrounds, combining the different perspectives from which they were working as researchers, academics, activists, artists or simple citizens attending the events. The week, which included the active participation of Costas Douzinas, David Harvey and Engin Isin, allowed for further reflections on the right to the city, linking citizenship to practices of resistance and the commons, and encouraging new links across Italy and Europe. In the attempt to bring some concreteness, an ‘action’ was also organised during a workshop; the objective was to underscore the connection between property speculation in Rome and some influential newspapers that were heavily campaigning against on-going occupations in those days. Exchanging skills, experiences, viewpoints, the result was once again surprising: the intense dialogue between artists, activists and researchers gave rise to new questions, uncovering aspects of theories and practices that had remained unexplored for many. It made people rethink some aspects of their political practise. In the case of Teatro Valle, for instance, it fostered new reflections on the value and the modalities for enacting forms of networking. Although linguistic and cultural differences imposed some limits on the dialogue, the exchange proved to be fertile. 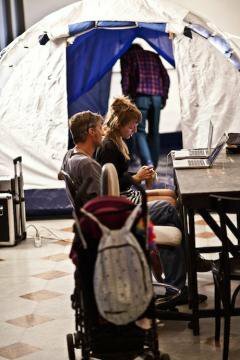 Citizenship and the city were confirmed as central tropes to understand and direct political action, while Teatro Valle confirmed its experimental role as a transformative space for the production of the commons. Gentili Dario (2011), Topografie della piazza: agorà, arengo, square, in Laboratorio Verlan (eds) Dire, fare, pensare il presente, Quodlibet, Macerata. Harvey David (2012), Rebel cities. From the Right to the city to the urban revolution, Verso, London, New York. Images courtesy of Tiziana Tomasulo. Videos courtesy of Macao.